Vince McMahon had announced that he would be letting the WWE Universe know about the biggest new acquisition to SmackDown Live in the main event of the blue brand to close the 2019 WWE Superstar ShakeUp. However, when the announcement was made, it was only Elias to the disappointment of the entire WWE Audience. However, there was more to come as an unexpected addition to the Blue Brand interrupted Elias and made their way to the ring. After attacking Elias, the acquisition attacked Vince McMahon as well, flattening the WWE Chairman in the middle of the ring. The WWE Superstar ShakeUp sees new additions to both brands, as RAW and SmackDown Live sees new Superstars added to the roster from NXT, 205 Live and the opposing brand. Last night saw AJ Styles added to WWE RAW. Styles was one of the top main event Superstars on SmackDown, and his loss would be keenly felt by the Blue Brand, as he had been on the roster since Day 1. Well, it looks like WWE wanted to replace like-for-like, and the newest addition to SmackDown Live has been one of the top RAW Superstars since day 1. Elias was about to sing and greet the Montreal Audience with insults, when he was interrupted by the 'Big Dog' Roman Reigns. Reigns made his way into to the ring, and did not waste any time whatsoever, before hitting Elias with a Superman Punch. Vince McMahon was furious and got in his face. Reigns did not hesitate. He hit the Chairman of the WWE with a huge Superman Punch. He then said that SmackDown Live was his yard and hit Elias with a Spear. The entire picture of SmackDown Live has now changed. 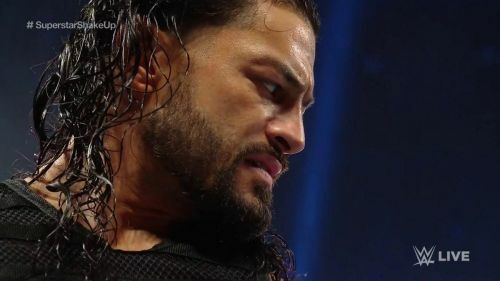 Roman Reigns is one of the biggest possible additions to the show.